The full text is now freely available with stable links. See the Complete Book tab above. You can buy a copy (and instructors can request an examination copy) from Cambridge University Press or your local bookstore or Amazon. The first edition is still available. 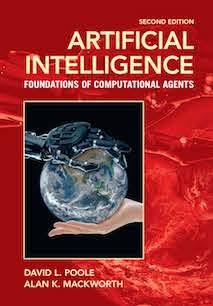 Artificial Intelligence: Foundations of Computational Agents, second edition, Cambridge University Press 2017, is a book about the science of artificial intelligence (AI). It presents artificial intelligence as the study of the design of intelligent computational agents. The book is structured as a textbook, but it is accessible to a wide audience of professionals and researchers. In the last decades we have witnessed the emergence of artificial intelligence as a serious science and engineering discipline. This book provides an accessible synthesis of the field aimed at undergraduate and graduate students. It provides a coherent vision of the foundations of the field as it is today. It aims to provide that synthesis as an integrated science, in terms of a multi-dimensional design space that has been partially explored. As with any science worth its salt, artificial intelligence has a coherent, formal theory and a rambunctious experimental wing. The book balances theory and experiment, showing how to link them intimately together. It develops the science of AI together with its engineering applications. AIspace: tools for learning Artificial Intelligence. Many of the examples in the book are animated by the AIspace tools. AIPython: Python implementations of most of the pseudo-code, that is designed to be as close to the pseudo-code as possible and to be useful. AILog is a representation and reasoning system with declarative debugging and explanation tools that implements many of the logical representations in the book, including negation-as-failure, abduction and relational probabilistic reasoning. We also have a (partial) solution manual you can get from David if you can prove you are teaching from the book.